"I want Howard Kogan to write things that make no sense. Read this book and see why he won’t." 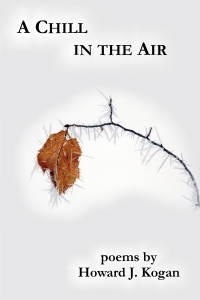 "There is no reason not to read Howard Kogan’s collection of poems, A Chill in the Air. Kogan invites us into the narrative poetry of personal history, insights on life and death and other assorted bits of his everyday with ease. I always thought he was just a wise guy, but you learn from reading this book that he is a wise man." Howard J. KoganHoward J. Kogan is a psychotherapist and poet. He and his wife, Libby, live in the Taconic Mountains in rural Upstate New York. His poems have appeared in Still Crazy, Occu-poetry, Poetry Ark, Naugatuck River Review, Jewish Currents Anthology, Literary Gazette, Pathways, Up the River, Point Mass Anthology, Misfit Magazine, Flair, and Award Winning Poems from Smith’s Tavern Poet Laureate Contest (2010 and 2011 Editions). His 2011 book of poems, Indian Summer, is available from Square Circle Press. His chapbook, General Store Poems, published by Benevolent Bird Press in 2014, is available from the author. Please contact us to schedule an author appearance, signing, or lecture. ©2016, Square Circle Press LLC. All rights reserved. This page last updated 11/21/16.